Advertised as a family activity, the workshop attracted a wide range of ages. Modern book making is a highly mechanized business. In the most common case, sheets of paper are piled together into a block, the spine edge might be sanded or notched, glue is applied, and a cover attached. There is little handcraft in the process, and when you consider the adage, “Good, cheap, and fast—you get to choose two,” modern glue binding is mostly cheap and fast. 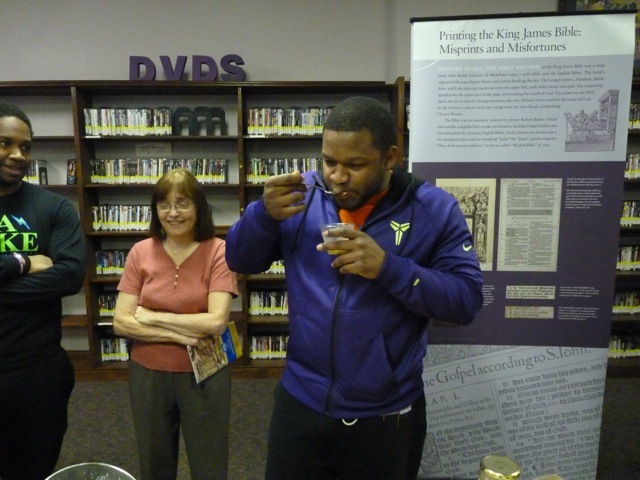 On April 25, some Tifton-Tift County library patrons got an opportunity to see how book production might have occurred in 1611. Jerry Walker, a retired educator with a lifelong interest in the arts and a highly skilled crafter, led a workshop that we titled “Let’s Make a Quarto: a type of book made in the Renaissance era.” The workshop was held in the museum that houses the Manifold Greatness exhibit, so anyone who had not seen the exhibit got the opportunity to see it then, as well as make their own little book. 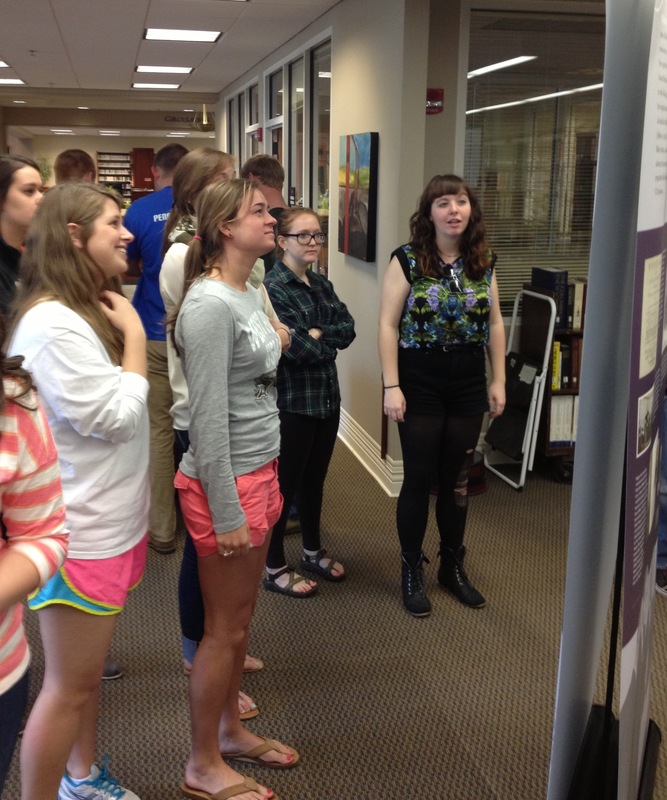 The quarto workshop was held at the Tifton Museum, where Manifold Greatness is on display. The basic idea behind a quarto is that a large sheet of paper is folded to make four smaller pages (hence the “quarto”). It was a very common way of producing books during the time of the King James Bible, allowing eight pages to be printed with only two trips through the press and using only one sheet of paper. Some of our participants found out the hard way what this folding does to the orientation and the numbering of the pages. We suggested folding the paper, marking the page numbers and the bottom of the pages with a pencil, and then unfolding the page before decorating the pages with a story, stamps, stencils, pictures, and other decorations. (There was no glitter—we had used it all at the Renaissance Faire.) We got some great little stories and pictures. Some of them were upside down and in the wrong order, but we decided that you learn from mistakes, too. Our amateur bookbinders learned how pages were made into “gathers” and then sewn together to make a finished book, ready to be bound. On the 16th of May, Tracy Iwaskow will be coming from Emory University’s Theology Library and will be bringing some selections from their special collections. Many of the participants are looking forward to seeing examples of the professional bookbinder’s craft. Vickie Horst is the Manager of Tifton-Tift County Public Library in Tifton, Georgia. You can find additional information about Making a Quarto, including a video, on the Manifold Greatness website. 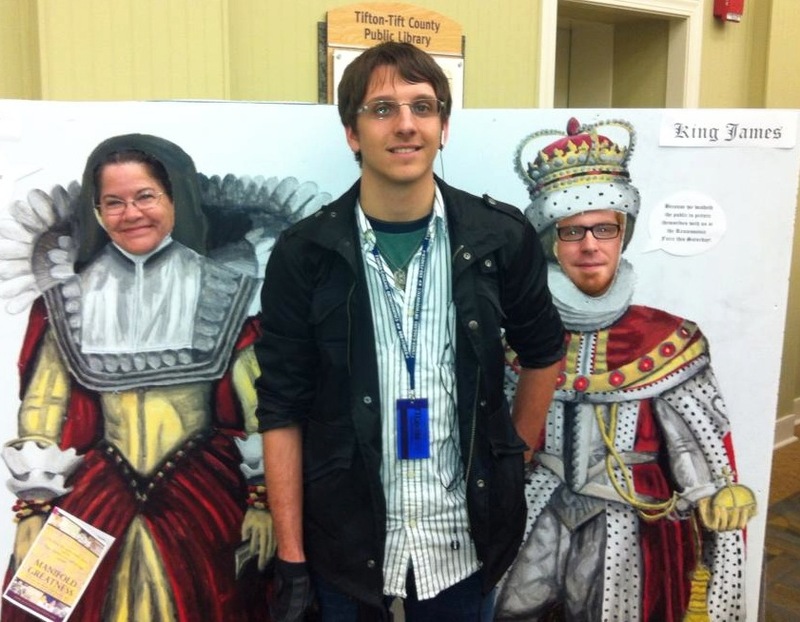 Library employees Trina Jones and Mack Freeman pose with artist/student worker Jesse Carpenter. 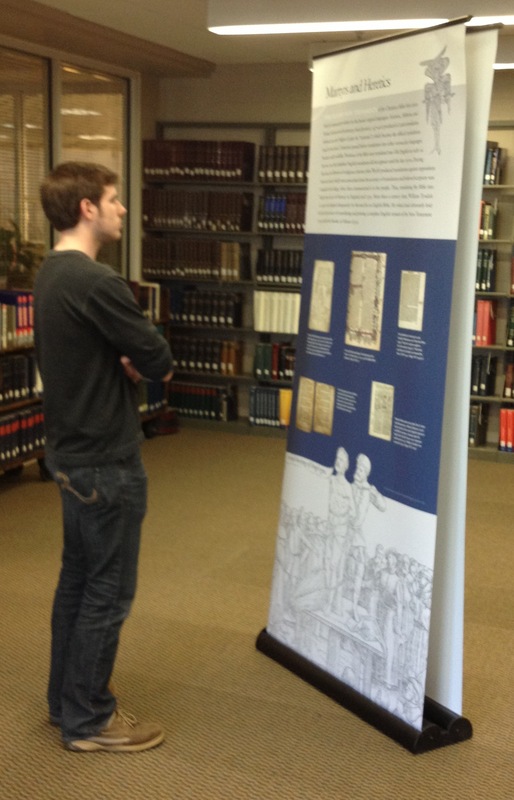 What do you do when you have an exhibit celebrating the 400th anniversary of the printing of the King James Bible? What do you do to get a small, rural community in south Georgia in the right mindset for an exhibit and an onslaught of information on the politics and history surrounding a book that most people know very well, but probably have never thought seriously about? Well, in Tifton, Georgia, we put on a Renaissance Faire and partied like it was 1611! This event gave a lot of people an opportunity to get in touch with their inner RenRat. Attendees were encouraged to attend in costume and were given handouts instructing them on how to speak “The King’s English.” The library staff and our amazing volunteers lavished endless attention on costumes and pavilions. Jesse Carpenter, one of our student workers, was recruited to produce cutouts that included King James himself. 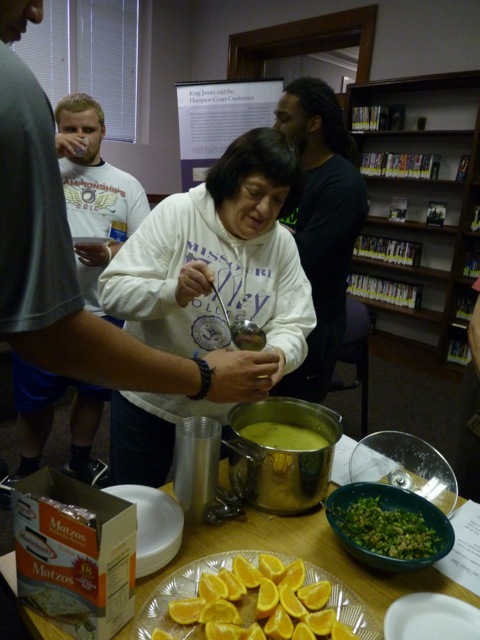 Members of the Literacy Volunteers and the Rotary Club were cajoled into selling era-appropriate food to our visitors. One of the interesting facts we discovered while researching the time is that gingerbread men were invented during the reign of Queen Elizabeth I! A children’s tent was dedicated to the production of quill pens, swords, shields, and crowns. It is hard to know how long the street will be glittered. We also had a volunteer that taught a steady stream of people how to play Nine Man Morris, a game that we discovered was popular during the time. Wagering on outcomes was not encouraged during our faire. 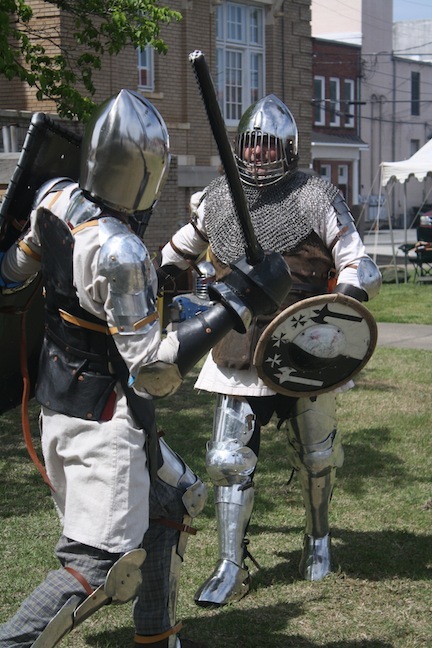 One of the highlights of the faire was the participation of the Society for Creative Anachronism. These talented individuals came and set up tents and demonstrated blacksmithing, illumination, dancing, sewing techniques, and FIGHTING! Knights fought for the honor of fair maidens picked from the audience and to advance their status in their shires. It was loud and exciting and very, very popular with our visitors. Cameras were encouraged and the fighters were probably the most photographed characters on Faire day. 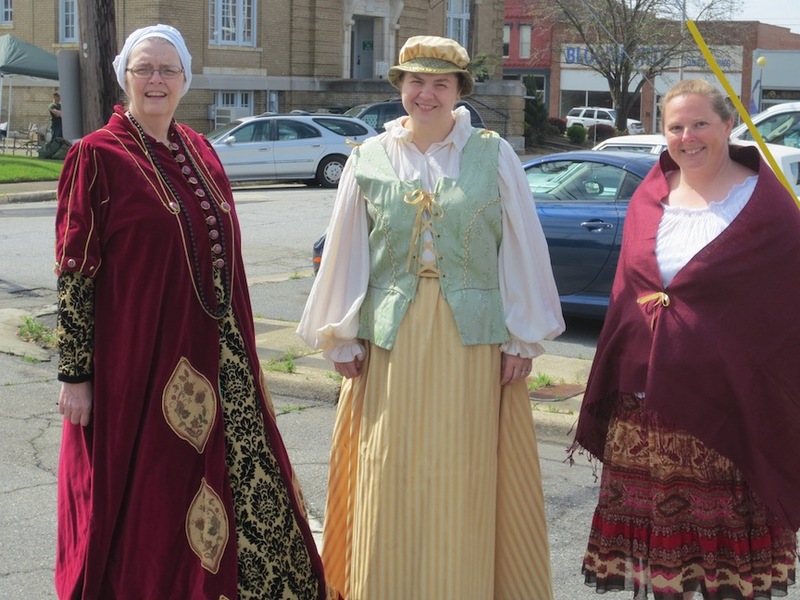 Costumed volunteers added ambiance to our Manifold Greatness opening day! Why did we open the exhibit this way? It was important for us to have a strong kickoff event for the exhibit. We were looking for something that would appeal to a large number of people, people who might not have thought to come to the exhibit, but might come to the Faire, eat a smoked turkey leg, and then decide to go and see what was happening with the exhibit. We believe that the Faire did this for us. The exhibit had a very strong opening day and we hope that, because we were able to promote the rest of the programming surrounding the exhibit more personally with the Faire-goers, we have good turnouts for what is to come. On Wednesday, April 17, the Manifold Greatness display arrived at Centre College in Danville, Kentucky. 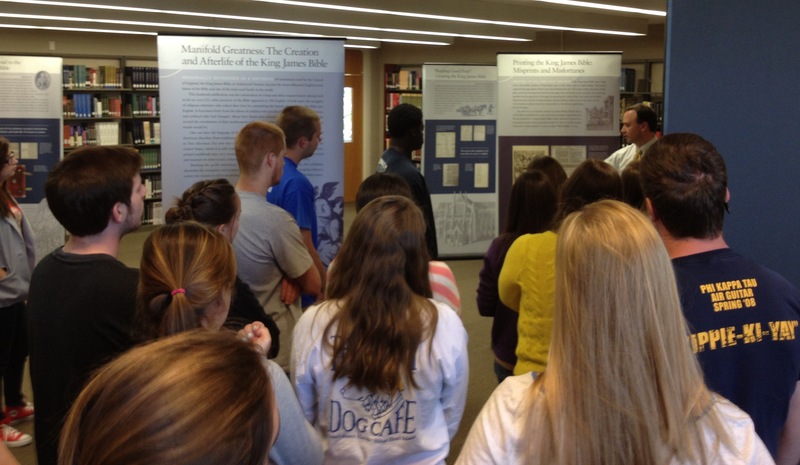 To kick off the exhibit, the college hosted a talk by Professor Bart D. Ehrman, entitled “Misquoting Jesus: Scribes Who Changed the Scriptures and Readers Who May Never Know.” The talk was a great success, attended by an estimated audience of 700 people, and students and community members began to observe the exhibit in Centre’s Grace Doherty Library. 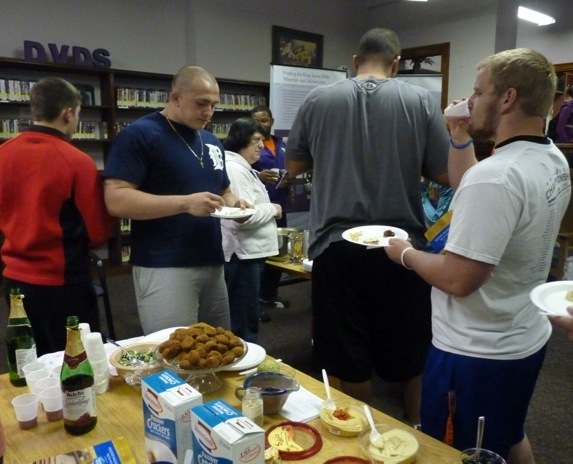 The exhibit also offers many teaching moments in the life of the college. 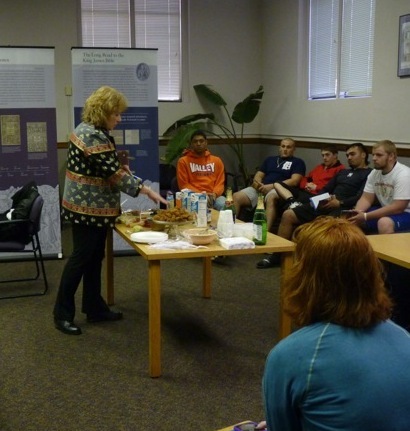 My religion course, entitled “Biblical History and Ideas,” explored the exhibit. The course examines the historical context surrounding the composition and reception of the Bible, and the translation of the King James Version directly relates to elements in the course. After studying elements of the original Hebrew text that were “lost in translation,” such as Jerome’s translation in his Vulgate of Exodus 34:29, the radiant face of Moses (cornuta esset facies), the students were able to witness the legacy of such translations on the original title page of the King James Version, featuring a Moses with “horns.” The exhibit is able to visually express details involving biblical translation in a vibrant and memorable way. Lee Jefferson is Assistant Professor of Religion at Centre College in Danville, Kentucky. See this announcement and this list of programs for more information on Manifold Greatness at Centre College. Curated display presenting the history of books. Tuscaloosa Public Library. 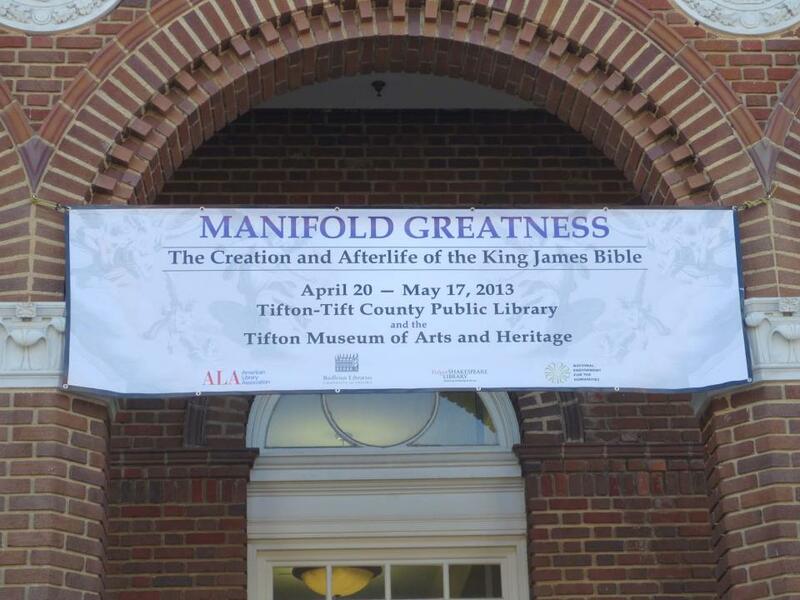 After a successful month of hosting specialized events, scholarly presentations, and tours, the Tuscaloosa Public Library said farewell to the Manifold Greatness traveling exhibit on Friday, April 5. 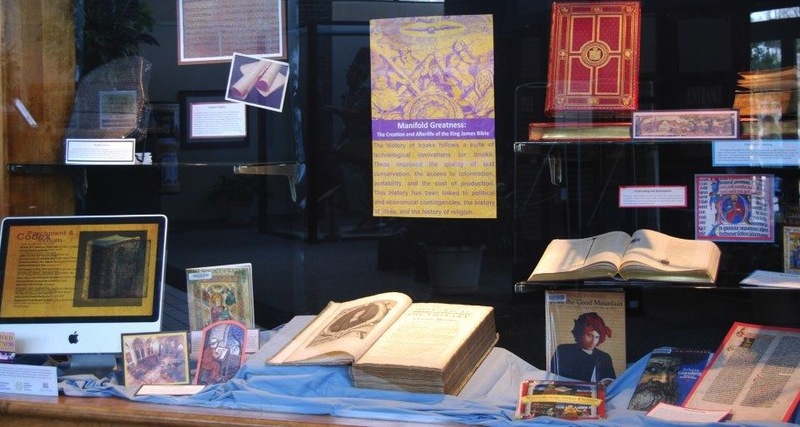 Bringing in over 2,500 visitors, Manifold Greatness proved to be a successful addition to the library and gave patrons a new perspective on how books influence the past, present, and future. 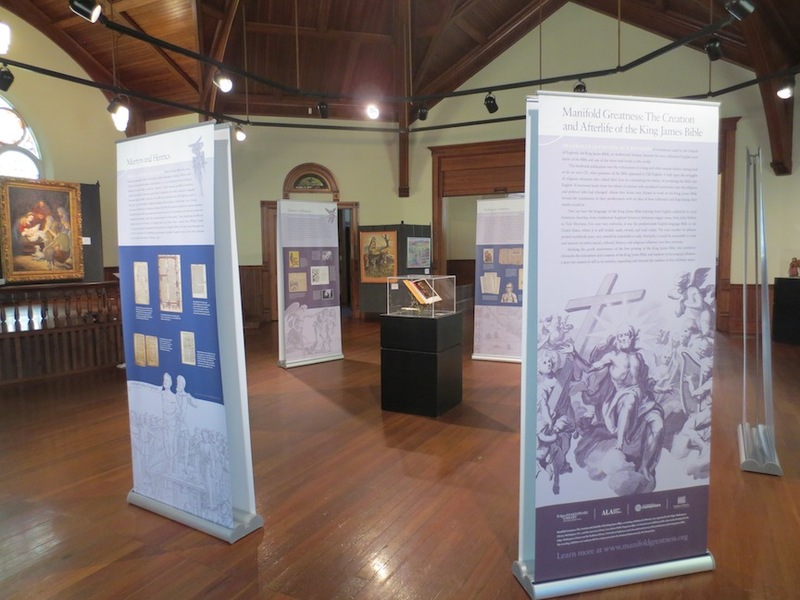 We wrote an earlier blog post about our Opening Reception, which included a talk on the early English Bible translator William Tyndale. Our second scholarly program, pictured here, was entitled “Books: The History and Art of Letterpress Printing.” Samford University Associate Professor Scott Fisk used the history of book arts to frame a discussion of how society often forgets the importance of books and their impact on us. 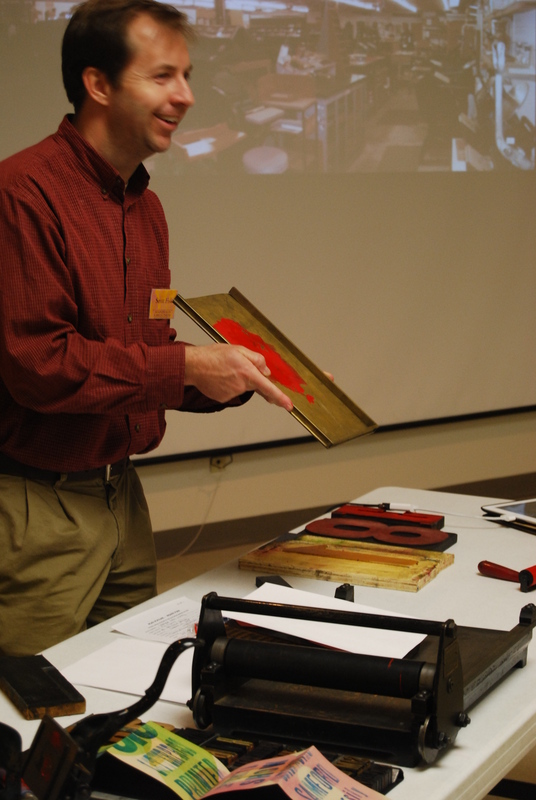 Attendees discussed developments in printing and were given the opportunity to witness firsthand the process of letterpress printmaking with a miniaturized printing press made for traveling salesmen in the late 1800s. Other materials such as broadsides, antique books, and wood type were available to demonstrate the form and function of early book making. 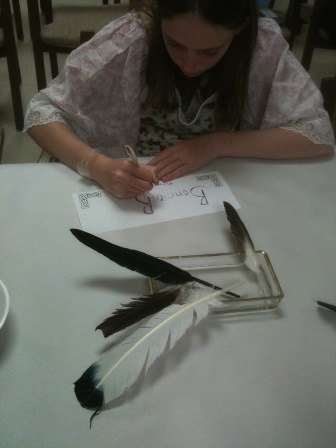 Bonnie tries calligraphy during the New School Tuesday ink and quill program. 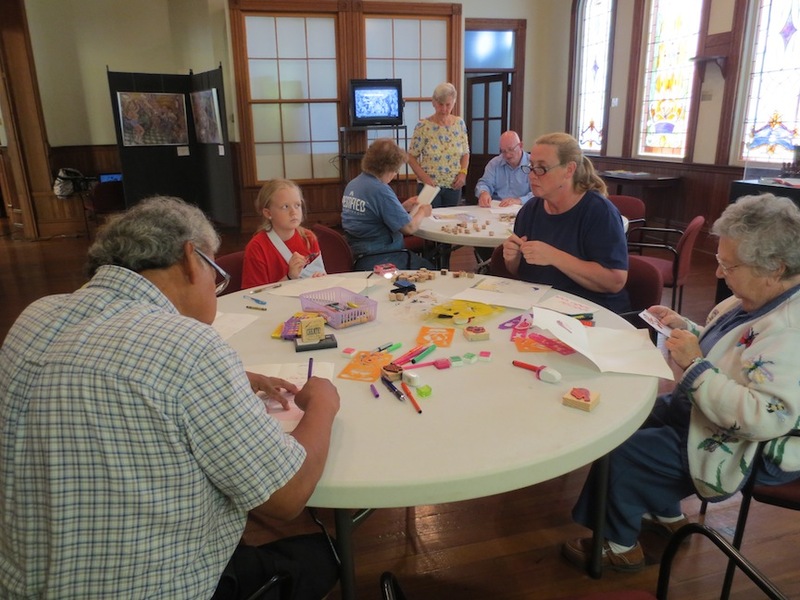 A family-friendly craft program, using a craft organized for our Opening Reception, rounded out the month of Manifold Greatness programming. Kids and their parents were given the chance to create blackberry ink and feather quills. They were then given the chance to use their ink and quills to practice some calligraphy and create name plates for an ongoing bestiary project. Through the Manifold Greatness exhibit and the five corresponding displays curated by library staff, the Tuscaloosa Public Library was able to present a cohesive timeline beginning with the development of writing, the invention of paper, the migration from scrolls to codices to present day books, and how these inventions have influenced the world, made the creation of the King James Version possible, and had a major impact on authors, artists, and musicians. 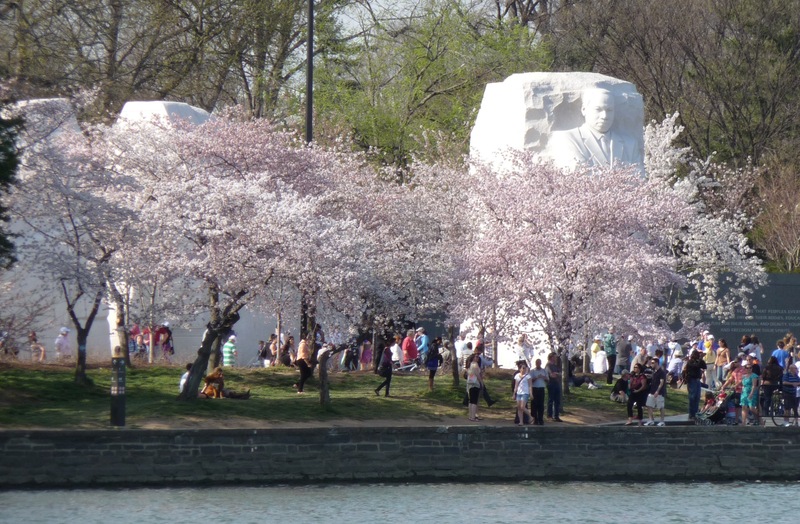 King Memorial and cherry blossoms, April 8, 2013. We thought we’d revisit the Martin Luther King, Jr. Memorial, first discussed in this blog post by Manifold Greatness curator Hannibal Hamlin around the time of the memorial’s original (but storm-delayed) dedication in August 2011. 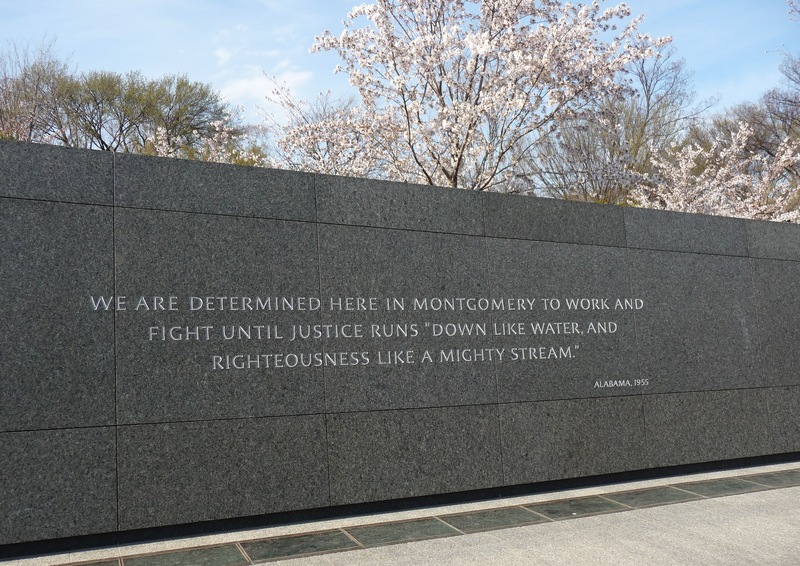 Martin Luther King often quoted from the Bible, including the King James Bible, in his speeches, including a line from Amos evoking a time when justice runs down “like water, and righteousness like a mighty stream.” You can see that quotation in the inscription here from a 1955 speech in Montgomery, Alabama. 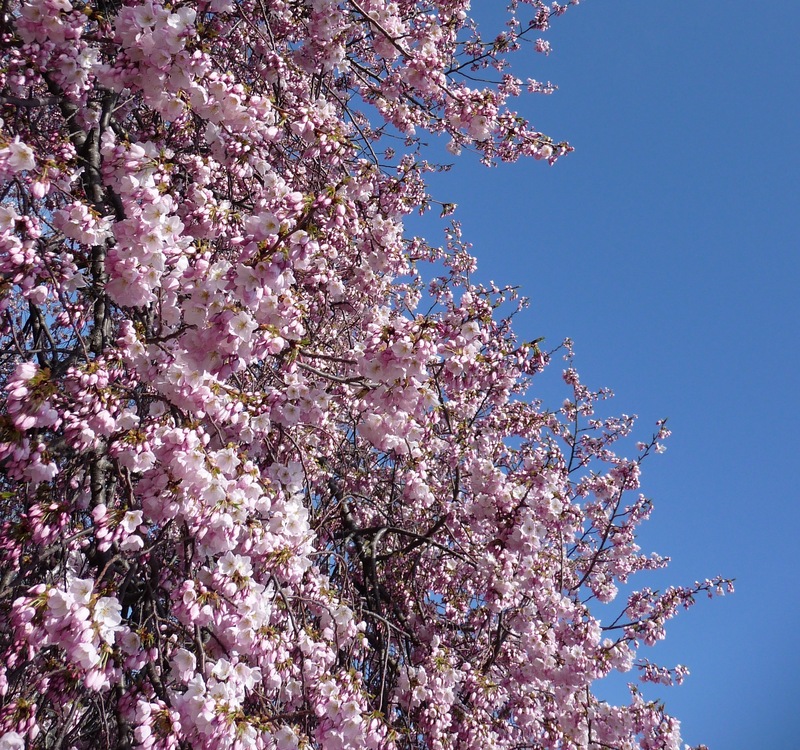 And yes, those are cherry blossoms at the top of the picture! Over the past year and a half of the Manifold Greatness exhibit’s continuing travels, some of the Manifold Greatness host sites have included special events that touched on King’s use of the King James Bible as well as the connection between the King James Bible and the black church tradition. For more examples of the role of the King James Bible in American public life, you may want to explore the Modern Life image gallery on our Manifold Greatness website. Jefferson Memorial. April 8, 2013. 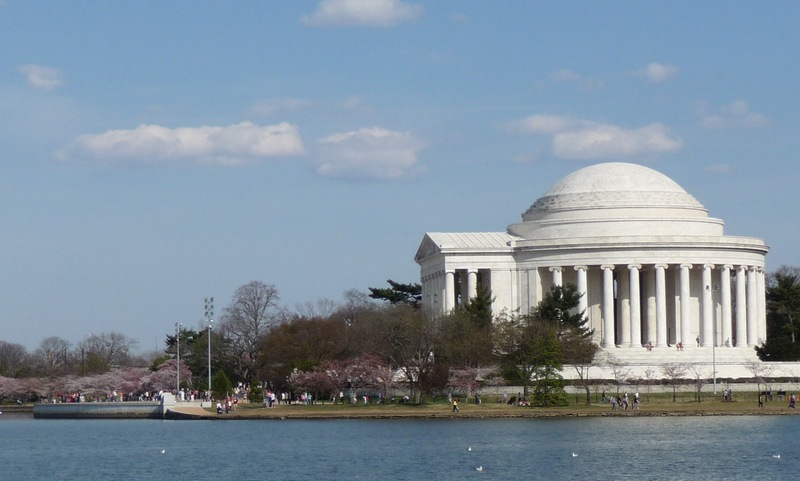 The King Memorial is located directly on the Tidal Basin, which is encircled by those blossoming Japanese cherry trees. King’s statue looks across the water at the Jefferson Memorial, which has its own historic associations with the King James Bible. One of Thomas Jefferson’s post-presidential projects was to assemble, from scripture, an account of Jesus’ teachings that excluded supernatural elements, producing what he called The Life and Morals of Jesus of Nazareth. You can see one passage in the Historic American Bibles image gallery on the Manifold Greatness website, or learn much more about it at the Smithsonian’s Thomas Jefferson’s Bible, which includes a complete online facsimile. In between the Jefferson and King memorials along the edge of the Tidal Basin is the Franklin Delano Roosevelt Memorial. Unlike many American presidents, however, Roosevelt does not offer us a simple King James Bible connection through his inauguration ceremonies. Franklin Roosevelt followed the tradition of being sworn in on a Bible, and he used the same one for all four inaugurations (he had also used it when he was sworn in as governor of New York in 1928 and 1930). But it was not the King James Bible. Roosevelt was sworn in on his family’s 1686 Dutch Bible (scroll down to see photos), the oldest Bible used at any presidential inauguration to date, and the only inaugural Bible in a modern foreign language, Dutch. The traveling exhibit Manifold Greatness: The Creation and Afterlife appears next in mid-April at Centre College in Danville, Kentucky; the Tifton Museum of Arts and Heritage in coordination with the Tifton-Tift County Public Library in Tifton, Georgia; and the Hays-Heighe House at Harford Community College in Bel Air, Maryland.